On the heels of yesterday’s post, Threshold of Tolerance, I have found myself thinking more and more about that post. Yes, I more or less declared that in extreme cases of disrespect I approve of physically reprimanding my child(ren). And yes, that might be an unpopular position. And no, I haven’t changed my mind in 24 hours. Rather, we have received a curve ball that makes me further think about my feelings. After three days of complaining and mastering a dramatic limp, I took Drew to the doctor. He ended up being diagnosed with Kohler Disease (anyone know of anyone else this??). He must wear a boot for about two months and refrain from physical activity. SAY WHAT????????? Do these people understand what this means for my sports crazed, ants-in-his-pants maniac man???!!! This is the worst sentence this child could possibly imagine. He’d choose a slap in the face any day to this!!!! He sobbed the entire way home from the doctor. I felt like I had been hit by a bus. I didn’t know how to process this. I couldn’t imagine how to position this for Drew. I couldn’t wrap my all the activities that he could no longer participate in. But the hardest thing to stomach was the heartbreak. Yesterday I talked about kids getting so wrapped up in their anger that they say hurtful, upsetting things. I neglected to mention that us parents also say (and do) hurtful and upsetting things in these same frustrating engagements with our children. I still stand by my initial argument that there are rare opportunities where children may need some firmer disciplining to properly outline their disrespect. But the thought of my son being heartbroken, breaks my heart. The thought that I could or would ever do anything to hurt him intentionally is hard to handle. My number one goal of parenting is to raise happy, healthy, safe, functional children who grow up not only having a good relationship with me but wanting a good relationship with me. I’m not so sure how to get there, I just know I want that outcome. I want my children to behave in a certain way that encourages that life and those values. However, I don’t really know what I can do to reap that. I’m guessing…much like everyone else. At the end of this story, or at least day one into it, Drew is feeling like a celebrity. All his friends want to know what happened, everyone wants to be his helper and he’s receiving a lot of extra attention and rewards from everyone. I think he got past his initial heartbreak. I do, however, think there’s a long road ahead for our story with the boot. I’m sure he’ll be frustrated and upset before long. All I know it that seeing his sweet little face so sad, there was nothing else in the world I wanted to do but protect him. Protect him from future pain, even if it is rightfully sent his way at the power of my own hand. It’s my job to protect him and keep him safe…even if it means doing or saying things I’m uncomfortable with to hopefully help us on the (G-d willing) long road to the end result – my goal (My number one goal of parenting is to raise happy, healthy, safe, functional children who grow up not only having a good relationship with me but wanting a good relationship with me). 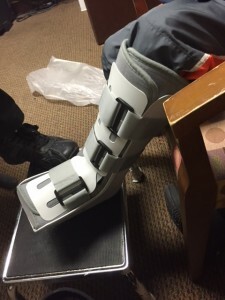 So sorry to read about Drew’s boot. Hope his time away from sports is easy on all of you!